Despite its compact size, the Avision AD125 is ready to scan full-color double-sided originals at a high speed of up to 25 ppm and 50 ipm in 200 dpi thanks to the advanced 50-sheet auto document feeder. Every AD125 model is equipped with a CCD sensor for high quality scans, and a 50-sheet capacity of the ADF for efficient batch scans. With Avision's newly developed software application- Button Manager V2, the scanner allows you to complete your scan with a push of the Scan button and send the scanned image to a specified destination including e-mail, printer, image editing software application, or even a cloud server such as Google Drive or Microsoft SharePoint. The AD125 delivers fast scan rates of 25 pages per minutes in simplex mode and 50 images per minutes in duplex mode at 200 dpi in color mode, providing a truly breathtaking digitalizing experience. A robust 50 page Automatic Document Feeder with a 3,000 pages per day duty enable the Avision AD125 to be used in any application requiring frequent document scanning. With a space-saving design at only 308mm x 156mm x 145mm (12.1 x 6.2 x 5.7 in), the AD125 can fit comfortably in most front office environments. The Avision AD125 delivers outstanding performance and its design is earth-friendly at the same time. The LED technology requires no warm up time and is lower power consumption without generating mercury vapor as other traditional scanners using the CCFL (cold cathode fluorescent lamp) technology. With a simple touch of the button, users can conveniently scan and send images to E-mail software, printer, specific folder, favorite software application, a cloud server such as Google Drive or Microsoft SharePoint within seconds without additional learning. 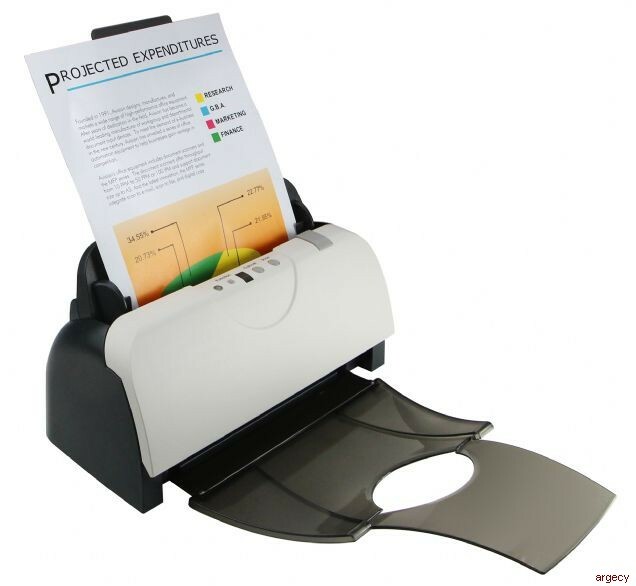 With a 50-page auto document feeder, the AD125 is able to scan document continuously without interruption. The Avision AD125 comes with TWAIN and ISIS drivers, and is bundled with a suite of powerful software applications that include Avision Button Manager V2, AvScan 5.0, and ScanSoft PaperPort SE 14. With Button Manager V2, you can create searchable PDFs, scan and send images to e-mail, printer, or other destinations with a simple press of the Scan button. The AVScan V5 and ScanSoft PaperPort are highly effective image processing and document management software that helps you streamline your task more efficiently.